Katherine Hoover, born in West Virginia in 1937, is a successful flutist and composer. More than a dozen of her compositions have been recorded, several more than once (and her Kokopeli for solo flute at least four times). However. there has never been an entire LP or CD devoted entirely to her music until now. Intellectually stimulating yet accessible, Hoover’s music has been very popular with audiences outside “new music” circles. 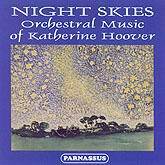 Night Skies includes four orchestral works of Hoover’s, all first performed since 1987. Three of them -Two Sketches, Eleni: A Greek Tragedy, and the title work–are performed by the Slovak Radio Symphony orchestra under the direction of American conductor Joel Eric Suben. In Eleni the vocal soloist is mezzo-soprano Denisa Danielova. These recordings were supervised by the composer. The Double Concerto is played by a U.S. orchestra making its recording debut: the Wisconsin Philharmonia, conducted by Vartan Manoogian, with violin soloists David Perry and Suzanne Beia. David Perry & Suzanne Beia (violins), The Wisconsin Philomusica, Vartan Manoogian, conductor. Slovak Radio Symphony Orchestra – Joel Eric Suben, conductor.